Presynaptic homeostatic plasticity (PHP) controls synaptic transmission in organisms from Drosophila to human and is hypothesized to be relevant to the cause of human disease. However, the underlying molecular mechanisms of PHP are just emerging and direct disease associations remain obscure. In a forward genetic screen for mutations that block PHP we identified mctp (Multiple C2 Domain Proteins with Two Transmembrane Regions). Here we show that MCTP localizes to the membranes of the endoplasmic reticulum (ER) that elaborate throughout the soma, dendrites, axon and presynaptic terminal. Then, we demonstrate that MCTP functions downstream of presynaptic calcium influx with separable activities to stabilize baseline transmission, short-term release dynamics and PHP. Notably, PHP specifically requires the calcium coordinating residues in each of the three C2 domains of MCTP. Thus, we propose MCTP as a novel, ER-localized calcium sensor and a source of calcium-dependent feedback for the homeostatic stabilization of neurotransmission. Homeostasis can be defined as the ability of a cell,or system of cells, to detect a perturbation and, in the continued presence of that perturbation, generate a compensatory response that precisely restores baseline function. It is well established that homeostatic signaling stabilizes the active properties of excitable cells, including neurons and muscle (Davis, 2006, 2013; Davis and Müller, 2015; Marder, 2011; Turrigiano, 2011). It is also generally accepted that neuronal homeostatic signaling will be essential for the life-long robustness of brain function and animal behavior (Davis, 2006, 2013). Indeed, numerous reviews have speculated about potential connections between homeostatic plasticity and psychiatric or neurological disease, including autism spectrum disorders (Mullins et al., 2016; Nelson and Valakh, 2015), schizophrenia (Dickman and Davis, 2009) and epilepsy (Noebels, 2015). But, the cellular and molecular underpinnings of neuronal homeostasis are only just beginning to emerge through forward genetic and biochemical screening efforts (Dickman and Davis, 2009; Davis and Müller, 2015). Delineating these signaling systems and defining how they succeed or fail, in health and disease, will be essential before concrete connections between homeostatic plasticity and disease can be established. Signaling mechanisms that are capable of homeostatic control are known to incorporate basic elements including sensors that can detect a perturbation, error signals that define the magnitude of a perturbation, feedback and feed-forward signaling loops, and mechanisms of signal integration (Alon, 2007; Cowan et al., 2014; Mitrophanov and Groisman, 2008; Lemmon et al., 2016). For example, we have a detailed understanding of the homeostatic signaling systems that control blood glucose levels and organismal metabolism. Hundreds of proteins and enzymes are organized into intersecting regulatory pathways, inclusive of feedback and feed-forward signaling elements that are dependent upon reversible and irreversible enzymatic reactions. By comparison, the biological basis for the homeostatic control of neural function remains almost completely uncharacterized. It seems essential that new homeostatic plasticity genes be identified so that entire signaling pathways can be delineated and new regulatory mechanisms defined. Here, we identify and characterize a novel presynaptic calcium sensor for homeostatic synaptic plasticity. We present evidence that this calcium sensor resides on the membranes of the presynaptic endoplasmic reticulum (ER) and, as such, defines a new homeostatic signaling relationship between the ER and the presynaptic neurotransmitter release mechanism. The homeostatic modulation of presynaptic neurotransmitter release, termed presynaptic homeostatic plasticity (PHP), is highly conserved from Drosophila to human (Davis, 2013; Davis and Müller, 2015). In response to a perturbation that disrupts the function of postsynaptic neurotransmitter receptors, there is a compensatory increase in presynaptic neurotransmitter release that precisely offsets the change in neurotransmitter receptor function and maintains postsynaptic excitation at baseline, set point levels (Davis, 2013; Davis and Müller, 2015). PHP can be rapidly induced on a time scale of seconds to minutes, can precisely adjust the presynaptic release mechanism to offset a wide range of postsynaptic perturbations and can be stably maintained for the life of an organism; months in Drosophila (Mahoney et al., 2014) and decades in human (Cull-Candy et al., 1980). It remains a formidable challenge to define signaling mechanisms that are capable of the rapid, accurate and persistent modification of presynaptic neurotransmitter release observed during PHP (Davis, 2006, 2013). Recent advances include the identification and involvement of a presynaptic ENaC channel capable of mediating analogue modulation of presynaptic calcium influx (Younger et al., 2013), the RIM/RIM-Binding Protein scaffold (Müller et al., 2012; Müller et al., 2015) and a novel presynaptic innate immune receptor, PGRP (Harris et al., 2015). Although these genes are causally linked to the induction and expression of PHP, the adaptive controls that are able to modulate the vesicle release mechanism in an accurate and persistent manner remain poorly defined. For example, how does a presynaptic scaffolding protein such as RIM participate in a regulated, rheostat-like control of presynaptic release? Homeostatic signaling systems are often built upon feedback signaling. But, to date, the molecular basis of homeostatic feedback within the presynaptic terminal remains a mystery. In the original forward genetic screen for candidate PHP genes (Dickman and Davis, 2009) we identified mutations that disrupted a gene encoding a C2 domain containing protein of unknown function, termed MCTP (Multiple C2 Domain Proteins with Two Transmembrane Regions). MCTPs are evolutionarily conserved proteins with three C2 domains and two C-terminal membrane-spanning domains (Shin et al., 2005). The C2 domains are unusual in that they are able to bind calcium with relatively high affinity (1–2.5 µM) and do so in the apparent absence of phospholipid binding (Shin et al., 2005). In C. elegans, genetic deletion of mctp is embryonic lethal (Maeda et al., 2001). In mammals, mctp is expressed in the brain and spinal cord and genetic mutations in mctp have been linked to bipolar disorder (Djurovic et al., 2009; Scott et al., 2009). Beyond this, little is known about the function of MCTP. Here, we demonstrate that Drosophila MCTP is resident on the membranes of the endoplasmic reticulum that extends from the soma to the presynaptic terminal. 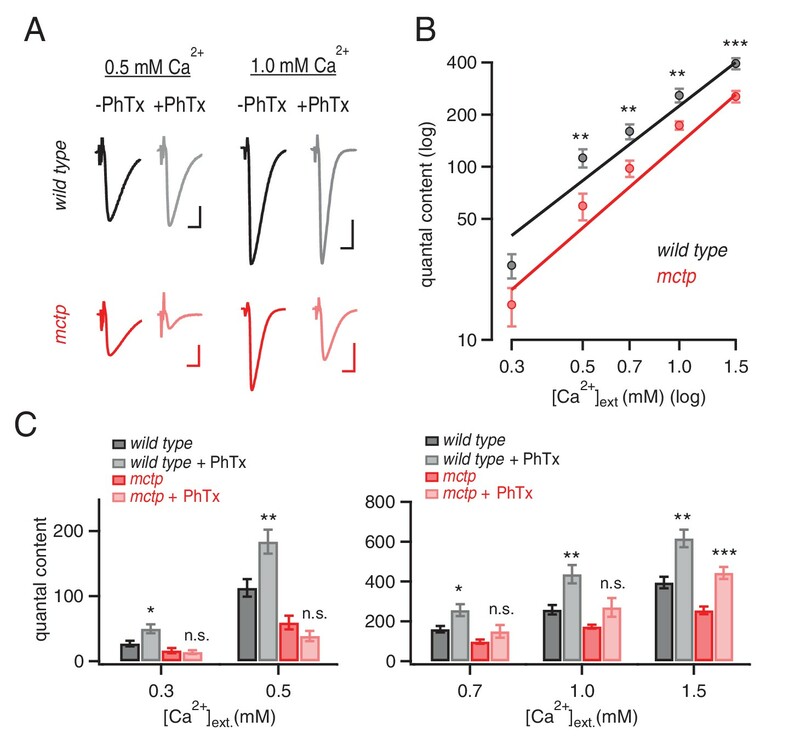 We provide evidence that MCTP functions in motoneurons as a potential source of calcium-dependent feedback control that sustains both baseline neurotransmitter release and presynaptic homeostatic plasticity. A large-scale forward genetic screen is being employed to identify genes that are required for PHP (Dickman and Davis, 2009; Younger et al., 2013; Müller et al., 2015). This screen is based on the application of the glutamate receptor antagonist philanthotoxin-433 (PhTx) to the NMJ at sub-blocking concentrations (4–20 µM). Following application of PhTx, miniature excitatory postsynaptic potential amplitudes (mEPSP) are initially decreased by ~50% and there is a parallel decrease in the amplitude of evoked excitatory postsynaptic potentials (EPSP) (Frank et al., 2006). During the next 10 min, in the continued presence of PhTx, mEPSP amplitudes remain inhibited while EPSP amplitude gradually increases, ultimately reaching amplitudes observed prior to the application of PhTx (Frank et al., 2006). Thus, enhanced presynaptic release rapidly and precisely offsets the magnitude of postsynaptic glutamate receptor inhibition, homeostatically restoring EPSP amplitudes. This process has been observed at mammalian central and peripheral synapses and is conserved at the human NMJ (Davis and Müller, 2015 for review). Recently, the rapid induction and rapid reversal of PHP were also documented at the mouse NMJ (Wang et al., 2016). To identify the molecular mechanisms of PHP, we have screened more than 2000 individual gene mutations for impaired PHP using electrophysiological recordings of synaptic transmission as a primary assay (Dickman and Davis, 2009; Müller et al., 2012; Younger et al., 2013). To date, very few genes have been identified that are required for both the rapid induction and sustained expression of PHP. This screen identified a transposon insertion in the mctp gene that blocks the rapid induction of PHP. The mctp1 transposon insertion resides in the non-coding, 3’ untranslated region of the mctp gene and is predicted to be a loss of function allele. We acquired a second transposon insertion (mctp2) that resides within a coding exon that is predicted to be a molecular null mutation as well as a deficiency chromosome that uncovers the mctp locus (Figure 1A). In addition, using CRISPR-mediated gene editing, we generated a single nucleotide insertion that creates a frame shift and an early stop codon at amino acid 132, an mctp mutation that is predicted to be a molecular null (mctpOG9). All three mutations are viable to the adult stage, allowing recordings to be made from normally sized NMJ at the third instar larval stage. MCTP is a multiple C2 domain protein, which is necessary for the synaptic homeostasis. (A) Top: schematic of the Drosophila mctp locus. The position of transposon insertion mutations (yellow triangles) and CRISPR-induced mutation (blue asterisk) are shown. Bottom: Diagram of the MCTP protein, which contains three C2 domains (orange round rectangles) and two transmembrane domains (blue rectangles). (B) Representative traces showing EPSPs and mEPSPs from mctp and wild type in the absence (left, black or dark red) or presence (light gray or light red) of philanthotoxin (PhTx) as indicated below. Scale bar: 4 mV/7 mV; 25 ms/60 ms. (C) Average percent change in mEPSP amplitude (filled bars) and quantal content (open bars) for the indicated genotypes, calculated as the percent change of each genotype in the presence of PhTx compared to baseline in the absence of PhTx. wild type (wt): n = 10 (-PhTx), n = 10 (+PhTx); mctp1: n = 11 (-PhTx), n = 8 (+PhTx); mctp2: n = 8 (-PhTx), n = 9 (+PhTx); mctp1/df: n = 8 (-PhTx), n = 7 (+PhTx); mctpOG9: n = 20 (-PhTx), n = 37 (+PhTx). Statistical comparisons are made comparing values in the presence or absence of PhTx within each genotype (Student’s t-test). (D–F) Quantification of mEPSP amplitude (D), EPSP amplitude (E) and quantal content (F) in the absence and presence of PhTx (as indicated). Statistical comparisons as in (C). (G) Representative traces for EPSPs and mEPSPs showing the restoration of the presynaptic homeostasis upon expression of a UAS-mctp transgene in neurons (elav-Gal4; black baseline; red +PhTx) Scale bar: 4 mV/7 mV; 25 ms/60 ms. (H–J) Quantification of average mEPSP amplitude, EPSP and quantal content for wild type (n = 10 without PhTx; n = 10 + PhTx), neural rescue (elav-Gal4) (n = 13 without PhTx; n = 10 + PhTx) and muscle rescue (MHC-Gal4) of mctp1 mutant (n = 11 without PhTx; n = 9 + PhTx) in the absence and presence of philanthotoxin (filled and open bars, respectively). Student’s t-test **p<0.01, n.s. p>0.05. First, we demonstrate that PHP is completely blocked in all three mctp mutants, as well as when mctp1 is placed in trans to the mctp deficiency (Figure 1B–C). More specifically, application of sub-blocking concentrations of PhTx causes a significant decrease in mEPSP amplitude in wild type and in all of the mctp mutant combinations that we tested (Figure 1D; Student’s t-test; p<0.01 for each genotype, comparing the absence versus presence of PhTx). In wild type, there is a homeostatic increase in quantal content (EPSP/mEPSP; Figure 1F; p<0.01) that precisely offsets the decrease in mEPSP amplitude and restores EPSP amplitudes to baseline (Figure 1B,E). However, in all four mctp mutant combinations, the homeostatic increase in quantal content is blocked (Figure 1F; p>0.05 for each genotype relative to baseline in the absence of PhTx) and EPSP amplitudes remain smaller than baseline (Figure 1E). Thus, mctp is essential for the rapid induction of PHP. 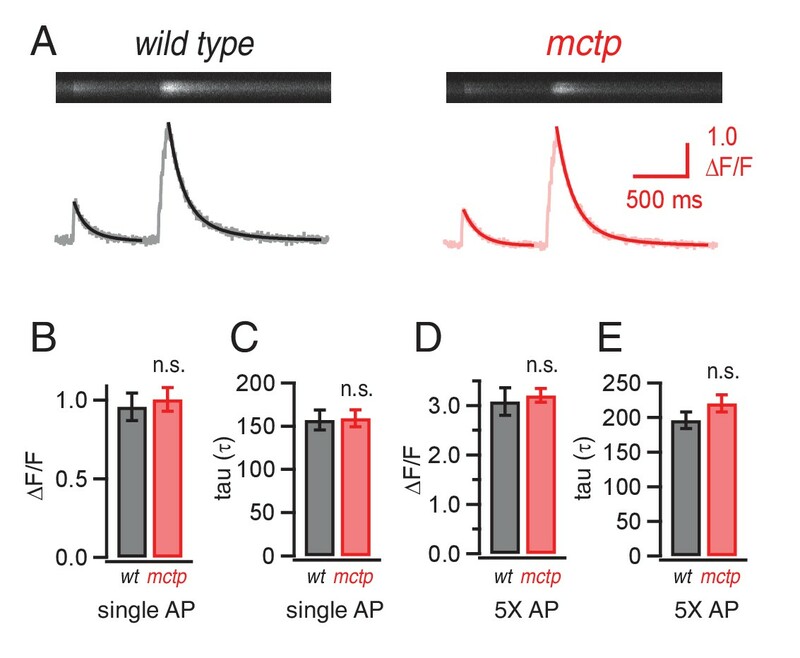 An analysis of baseline transmission in response to single action potential stimulation, under these recording conditions (0.3 mM [Ca2+]e), reveals a significant deficit in presynaptic release in all of the mctp mutant combinations that we tested. There is no difference in mEPSP amplitude in any genotype (Figure 1D, solid bars; p>0.05). However, all mutant alleles have diminished average EPSP amplitudes compared to wild type (Figure 1E, solid bars; p<0.05). Calculated quantal content is significantly decreased in mctp1, mctp2 and mctpOG9 (Figure 1F, solid bars; p<0.05). An additional analysis of baseline neurotransmission across a 5-fold range of extracellular calcium concentration, performed under two-electrode voltage clamp configuration and inclusive of an analysis of short-term synaptic modulation, is shown below. Importantly, while there are relatively mild effects on baseline transmission under these conditions, the expression of PHP is completely blocked. To confirm that MCTP is necessary for PHP and to define where MCTP functions, pre- versus postsynaptically, we performed genetic rescue experiments. A full-length mctp transgene was generated and expressed under UAS control using either the neuron-specific Gal4 driver elav-Gal4 or the muscle specific driver MHC-Gal4. Neuron-specific expression of UAS-mctp in the mctp1 mutant background (‘rescue neuron’ in Figure 1G–J) fully rescues PHP as demonstrated by a large increase in quantal content and the restoration of EPSP amplitudes to baseline values in the presence of PhTx (Figure 1G–J; p>0.5 compared to wild type for mEPSP, EPSP and quantal content values). By contrast, muscle-specific expression of UAS-mctp (‘rescue muscle’ in Figure 1G–J) does not rescue PHP. Indeed, we note that while expression of UAS-mctp in muscle alone has no effect on quantal content compared to wild type (p>0.1), in the presence of PhTx the quantal content is reduced below levels observed at baseline in the absence of PhTx, suggesting a dominant interfering effect of postsynaptic expression that is somehow specific to the condition of PhTx application. Regardless, taken together, these data confirm that mctp is essential for the rapid induction of PHP and that MCTP activity is necessary in the presynaptic neuron for PHP. 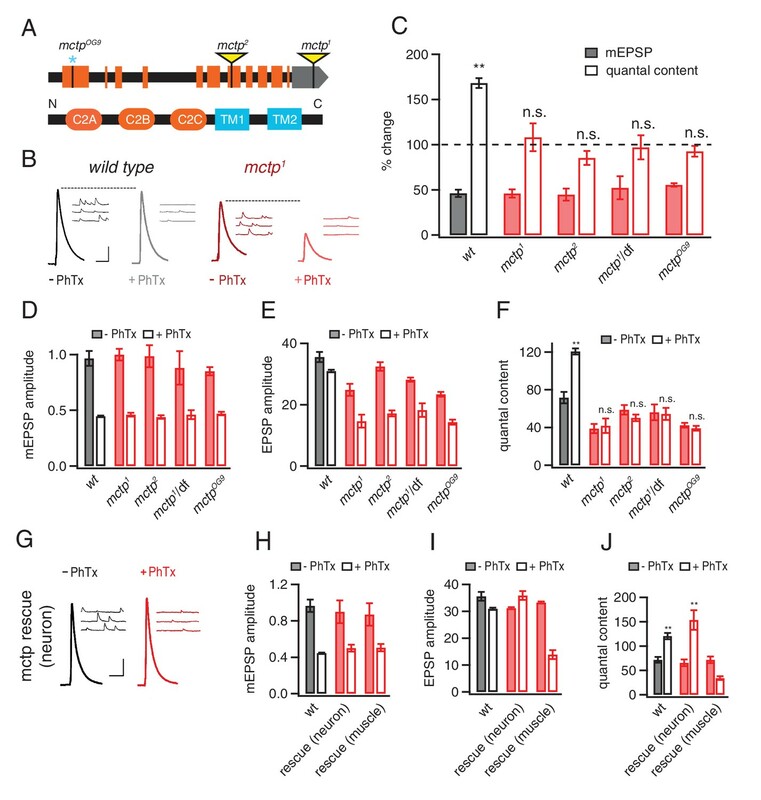 Mutations in the muscle-specific glutamate receptor subunit GluRIIA decrease mEPSP amplitudes and induce a homeostatic potentiation of presynaptic release (Petersen et al., 1997). This manipulation has been interpreted to reflect the long-term maintenance of PHP and represents an independent experimental method to induce PHP. 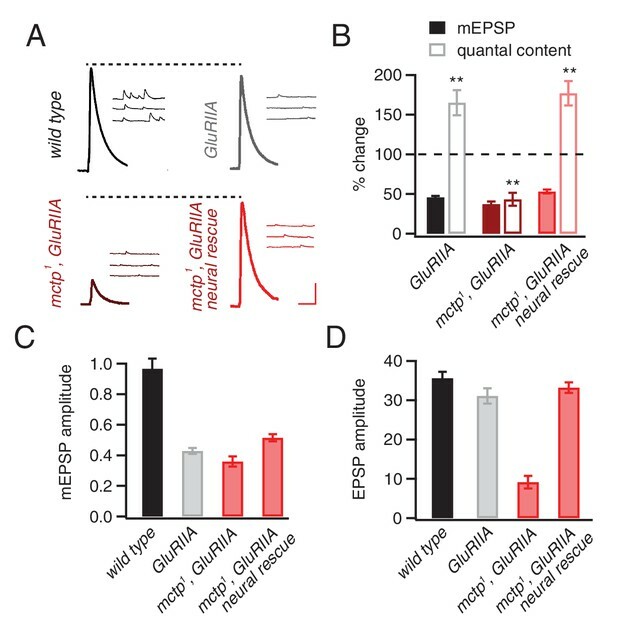 Here, we confirm that the GluRIIA mutant has decreased mEPSP amplitudes and a robust, homeostatic increase in quantal content (p<0.01). However, when PHP is assessed in the mctp1,GluRIIA double mutant, PHP is completely blocked (Figure 2). More specifically, in mctp1,GluRIIA double mutants, mEPSP amplitudes are decreased to levels identical to that observed in the GluRIIA mutant (Figure 2). But, unlike the GluRIIA mutant, there is a failure to increase quantal content (Figure 2). The specificity of this effect is confirmed by genetic rescue experiments. Presynaptic expression of UAS-mctp fully restores PHP in the mctp1,GluRIIA double mutant background (Figure 2). We note that quantal and EPSP amplitudes in the mctp1,GluRIIA double mutants are diminished below what is predicted by a simple block of PHP (Figure 2B,D). Since both EPSP amplitude and quantal content are fully restored by presynaptic expression of UAS-mctp in the mctp1,GluRIIA double mutant, this effect can be attributed solely to the loss of mctp. This effect could reflect an additional activity of MCTP that is required for the consolidation or maintenance of PHP. This possibility will be the focus of future studies. mctp is necessary for the sustained expression of homeostasis. (A) Representative traces of EPSP and mEPSP are shown for the following genotypes: wild-type (left, top), GluRIIA mutant (right, top), mctp1,GluRIIA double mutant (left, bottom) and neural rescue of mctp1,GluRIIA double mutant with UAS-mctp driven by elav-Gal4 (right, bottom). Scale bar: 4 mV/7 mV; 25 ms/60 ms. (B) Average percent changes in mEPSP amplitude (filled bars) and quantal content (open bars) for indicated genotypes compared to wild type (wild type: n = 10; GluRIIA: n = 8; mctp1,GluRIIA: n = 7; mctp1,GluRIIA neural rescue: n = 10). (C–D) Average mEPSP amplitudes and quantal content are shown for genotypes as in (A). Student’s t-test ** for p<0.01, n.s. for p>0.05. To examine MCTP protein localization, we visualized an epitope tagged MCTP protein (MCTP-Flag; see Materials and methods). Efforts to generate MCTP-specific antibodies were unsuccessful. We note that UAS-mctp expression fully rescues the mutant phenotype. MCTP has two highly conserved transmembrane segments, implying localization to a cellular membrane system. 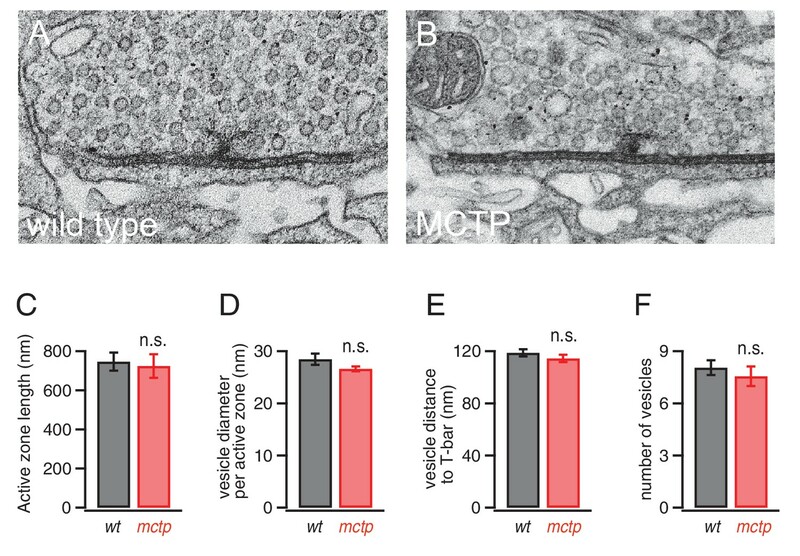 We now demonstrate that MCTP-Flag localizes to the internal membranes of the endoplasmic reticulum (Figure 3). We expressed UAS-mctp-flag in a pair of identified motoneurons that are segmentally repeated in the larval central nervous system using the MN1-Gal4 driver (see Materials and methods). Within the soma, MCTP concentrates within a reticulated, peri-nuclear membrane system (Figure 3A) and co-localizes with co-expressed ER-resident KDEL-RFP (not shown), indicative of ER localization. MCTP-Flag is observed to extend into the axon on similarly reticulated internal membranes (Figure 3A and inset). Co-staining with anti-HRP to label the neuronal plasma membrane confirms that these are a membrane system within the axonal plasma membrane (not shown). MCTP-Flag extends throughout the dendrites (Figure 3A) and then extends all the way to the presynaptic nerve terminal (Figure 3B). This is entirely consistent with recent studies in Drosophila and mammalian systems showing that the smooth ER extends throughout the soma, dendrite, axon and presynaptic terminal (de Juan-Sanz et al., 2017; Summerville et al., 2016). Consistent with this prior work, we demonstrate co-localization of MCTP-Flag with the ER resident protein HDEL-GFP (Summerville et al., 2016) in presynaptic terminals (Figure 3B, see also inset). In Figure 3B (inset) we show near perfect co-localization of MCTP-Flag with ER tubules identified by HDEL-GFP. In this experiment, the HDEL-GFP was imaged live to ensure proper ER morphology. The preparation was lightly fixed and stained for MCTP-Flag, showing precise co-localization of the markers and good preservation of the general ER morphology under our fixation conditions. In axons, MCTP-Flag also co-localizes with HDEL-GFP (Figure 3D). Epitope-tagged MCTP localizes to ER membranes. (A) Image shows the distribution of epitope-tagged MCTP in a single bilaterally symmetrical pair of motoneurons in the larval CNS (MN1-Gal4>UAS-mctp-Flag, green) The dotted line indicates the CNS midline and the numbers refer to inset images at right showing single confocal sections of peri-nuclear reticular membranes in the soma (1, 2) and the MCTP-labeled membranes that continue into the axon and dendrites (3). (B) Synaptic distribution of HDEL-GFP (green, top), imaged in a live preparation. Below, MCTP-Flag (red) is shown for the same NMJ following mild fixation and antibody labeling. The yellow box indicates the region shown at higher magnification to the right. The live HDEL-GFP and post-fixation MCTP-Flag identify the same tubular organization of the ER membranes within an individual synaptic bouton. No staining on the neuronal plasma membrane is evident. The NMJ is co-stained with a marker of the neuronal plasma membrane (anti-HRP, blue). Scale bar: 10 µm. (C) Structured illumination microscopy (SIM), single confocal section images of a synaptic bouton expressing the active zone marker Brp-GFP (driven by its endogenous promoter, green) and MCTP (OK371-Gal4>UAS-MCTP-Flag, red). Arrows indicate regions where MCTP resides in close proximity to Brp puncta, which define the T-bar structures that reside at the center of individual active zones. Scale bar: 1 µm. (D) Axon membranes from the peripheral nerve stained as in (B). Scale bar: 50 µm. (E) Single confocal sections of individual S2 cells transfected with MCTP-GFP and co-labeled with ER-tracker (red; see Materials and methods). At left, an S2 cell transfected with full length MCTP-GFP. At middle, an S2 cell transfected with a transgene expressing only the two-transmembrane region of MCTP linked to GFP (TM only-GFP). ER localization is retained. At right, an S2 cell transfected with a transgene expressing an MCTP-GFP transgene lacking the two-transmembrane domain and ER localization is lost (MCTP-noTM-GFP). Scale bar: 10 µm. To further investigate the sequences that localize MCTP to the ER, we resorted to a structure function analysis of the MCTP transmembrane domains, using heterologous insect cells (S2 cells). We demonstrate that the isolated transmembrane domains of MCTP are sufficient to localize GFP to the ER, defined by co-localization with ER-tracker (Figure 3E, compare full length MCTP-GFP to TM only GFP). Each image in Figure 3E is a single confocal section through the cell, highlighting the peri-nuclear organization of the ER. We then performed the converse experiment. When the two transmembrane domains of MCTP are removed from MCTP-GFP, the truncated protein no longer localizes to the ER and is found broadly distributed (Figure 3E, MCTP noTM GFP). Finally, we note that full length MCTP-GFP protein was never observed to reside on the cell plasma membrane (Figure 3E and data not shown). We then explored co-labeling with other synaptic markers at the nerve terminal. First, we co-stained the terminal with MCTP-Flag and the active zone marker anti-BRP and imaged the NMJ using super-resolution structured illumination microscopy (Figure 3C). Single sections reveal that MCTP-Flag does not co-localize with anti-Brp, but does come into close proximity at many, though not all, active zones (Figure 3C). Next, we perform co-labeling with the synaptic vesicle marker anti-synaptotagmin1 (Syt1; Figure 4). We note that MCTP is essentially absent from clusters of synaptic vesicles, identified by anti-Syt1 staining (Figure 4B arrows). These data are consistent with retention of MCTP-Flag in the ER since over-expressed protein does not appear to extend to post-golgi membranes of synaptic vesicles. 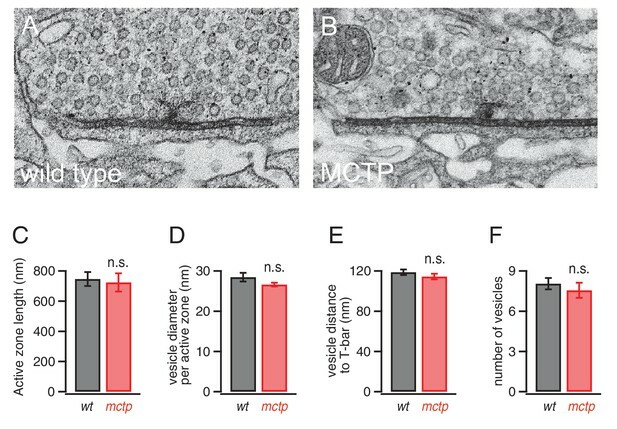 Co-labeling with a membrane marker (anti-HRP) again demonstrates that MCTP-Flag labeled membranes are often closely opposed to the neuronal plasma membrane (Figure 4 inset; See also Figure 3). This is intriguing given the recent demonstration that the Extended Synaptotagmins (eSyts), which are members of the same extended gene family as MCTP, localize to sites of ER-plasma membrane contact (Giordano et al., 2013). MCTP does not co-localize with the synaptic vesicle marker Syt1. (A) Synaptic distribution of MCTP-Flag (green) at the NMJ. (B) The synapse in (A) co-stained with markers of the plasma membrane (anti-HRP, blue) and synaptic vesicles (anti-Syt1, red). Arrows indicate regions where Syt1 immunoreactivity is abundant and MCTP-Flag is absent. Insets (below; 2.5x magnification) of the region indicated by a horizontal line (top left) reveal regions occupied by Syt1 staining that are devoid of MCTP-Flag at higher magnification. Additional analysis of NMJ bouton anatomy and cytoskeleton is presented in Figure 4—figure supplement 1. We acknowledge that our evidence for ER localization is based on protein overexpression. Ideally, the subcellular localization of a protein would be determined by comparison of multiple assays, including visualization of a fluorescently tagged protein in living cells and immunofluorescent localization in fixed, permeabilized tissue (Stadler et al., 2013; Schnell et al., 2012; Moore and Murphy, 2009; Huang et al., 2014). Both techniques have well-established caveats. The incorporation of a fluorescent tag into a protein of interest can alter protein localization, irrespective of whether the tagged protein is overexpressed or regulated by endogenous gene expression (Stadler et al., 2013; Schnell et al., 2012; Moore and Murphy, 2009; Huang et al., 2014). Similarly, fixation and tissue permeabilization can produce artifacts as can lack of antibody specificity (Stadler et al., 2013; Schnell et al., 2012; Moore and Murphy, 2009; Huang et al., 2014). We note, however, a recent study of more than 500 human proteins that documented ~80% concordance between fluorescent protein tagging and antibody labeling in human cell lines (Stadler et al., 2013). Thus, while acknowledging the caveats of each approach, there is evidence that each remains a reliable technique in modern cell biology. We were unable to verify MCTP localization with antibody staining. However, we do document identical MCTP localization in both neurons and S2 cells, rescue of the mctp mutant phenotype and we demonstrate the required function of the transmembrane region of MCTP for ER localization in S2 cells. Thus, based on these and related data, we conclude that MCTP is an ER resident protein, distributed on the ER throughout motoneurons. Several ER-resident proteins have recently been implicated in the control of synaptic morphology (Summerville et al., 2016; Moustaqim-Barrette et al., 2014; O'Sullivan et al., 2012; Lee et al., 2009). Therefore, we quantified NMJ morphology in the mctp mutant background. We find a small, but statistically significant, increase in bouton number in both mctp1 and mctp2 (Figure 4—figure supplement 1). These changes are in the same direction as that observed for the atlastin and spict mutations, both ER resident proteins, but are substantially milder (Summerville et al., 2016; Wang et al., 2007). We also quantified active zone number, assessed by counting the number of anti-Brp puncta that identify the presynaptic T-bar, resident at individual active zones. There is also no significant change in active zone number or active zone density (Figure 4—figure supplement 1). Beyond this, the mctp mutant NMJ appears morphologically normal, without the appearance of satellite boutons (Marie et al., 2004) and without any evidence of NMJ degeneration (Eaton et al., 2002). Previous studies have demonstrated that neuromuscular degeneration is associated with disruption of the presynaptic microtubule cytoskeleton, identified with anti-Futsch antibody staining (Pielage et al., 2008, 2011). We find that anti-Futsch staining is qualitatively normal, consistent with normal NMJ growth and normal NMJ integrity (Figure 4—figure supplement 1). We conclude that impaired homeostatic plasticity in the mctp mutants is not a secondary consequence of impaired NMJ growth, stability or active zone number. Next, we investigated whether loss of MCTP alters baseline neurotransmission and short-term plasticity over a range of extracellular calcium concentrations. We repeated our analyses of baseline transmission using two-electrode voltage clamp to measure EPSC amplitudes across a 5-fold range of extracellular calcium (0.3–1.5 mM [Ca2+]e) and find that EPSC amplitudes are significantly impaired across this entire range (Figure 5A). Thus, in the mctpOG9 mutant, there is an impaired calcium sensitivity of release (Figure 5A). This occurs without a change in the apparent calcium-cooperativity of release (see below), given that the magnitude of change is similar at all external calcium concentrations tested (Figure 5A). Consistent with the conclusion mctp alters baseline release, we also find a significant change in short-term release dynamics at 0.7, 1.0 and 1.5 mM [Ca2+]e (Figure 5B). Indeed, at 1.0 mM [Ca2+]e synaptic depression is observed at the wild type synapse compared to short-term facilitation at the mctp mutant synapse (Figure 5B). Similar alterations in short-term release dynamics were observed in the two additional mctp mutant alleles (data not shown). We then compare short-term release dynamics for wild type and mctp under [Ca2+]e where baseline release is equivalent. For example, comparing wild type at 0.5 mM [Ca2+]e with mctp at 0.7 mM [Ca2+]e it is apparent that baseline EPSCs are equivalent (p>0.05) and so are short-term release dynamics (p>0.05) (Figure 5A,B). These data suggest that the change in short-term release dynamics could be due to a decrease in presynaptic release probability in the mctp mutant compared to wild type. Regardless of the underlying cause, it is clear that mctp is essential for normal baseline neurotransmitter release and short-term synaptic plasticity. Altered baseline transmission and short-term plasticity in mctp mutants. (A) At left, representative EPSC traces for wild type (black) and mctpOG9 (red). The plot shows average EPSC amplitudes for wild type (gray) and mctpOG9 (red) at the indicated extracellular calcium concentrations. Sample sizes as follows: 0.3 mM: n = 10 (wt), n = 8 (mctpOG9); 0.5 mM: n = 13 (wt), n = 11 (mctpOG9); 0.7 mM: n = 7 (wt), n = 16 (mctpOG9); 1.0 mM: n = 16 (wt), n = 13 (mctpOG9); 1.5 mM: n = 12 (wt), n = 10 (mctpOG9). The decrease in mctpOG9 is significant at every calcium concentration (t-test). (B) At left, representative traces for short stimulus trains (60 Hz) for wild type (black) and mctpOG9 (red). Scale bar: 50nA, 50 ms. The plot show average EPSC ratio (4thEPSC/1stEPSC) at the indicated calcium concentrations for wild type (gray) and mctpOG9 (red). (C) Average EPSC rise time (20–80%) for wild type (gray) and mctp (red). D) Average EPSC amplitudes . (E) Average cumulative EPSC as in (D). (F) Representative data for the cumulated peak EPSC amplitudes following a train of action potential (60 Hz, 30 stimuli) shown for wild type and mctpOG9. Data are fit with a linear function at x = 20 to x = 29 and back-extrapolated to time 0, intersecting the y-axis. Student’s t-test ** for p<0.01, n.s. for p>0.05. Often, a change in presynaptic release probability is associated with a change in presynaptic calcium influx (Zucker and Regehr, 2002). Therefore, we assessed action-potential initiated presynaptic calcium influx by loading presynaptic terminals with the calcium indicator Oregon Green BAPTA-1 (OGB-1), according to published methods (Müller and Davis, 2012). Surprisingly, we find no difference in the action potential induced, spatially averaged calcium signal comparing wild type and the mctpOG9 mutant (Figure 6A,B). This lack of effect was true for single action potential stimulation as well as repetitive stimulation using five action potentials delivered at the same frequency used to document a change in presynaptic facilitation (Figure 6D). There was no change in the time constant of OGB-1 signal decay, consistent with the conclusion that the loss of MCTP does not significantly impact presynaptic calcium buffering (Figure 6C). Given that we are directly measuring the spatially averaged calcium signal that is believed to influence presynaptic release, the observed difference in action-potential evoked neurotransmitter release and short-term release dynamics in mctp cannot be accounted for by a change in presynaptic calcium influx, nor can it be accounted for by altered calcium efflux from the presynaptic ER. These data demonstrate that MCTP must act downstream of presynaptic calcium influx in order to influence synaptic vesicle release and short-term release dynamics. Action-potential induced calcium influx is normal in the mctp mutant. (A) Representative line-scan images at a single synaptic bouton revealing the spatially averaged calcium transients following a single action potential (first stimulus in trace) and a short train of action potentials (5 stimuli at 50 Hz, second stimulus in trace) for wild type (black) and mctpOG9 (red). Below the raw line-scan data are values (∆F/F) reporting the change in OGB-1 fluorescence relative to baseline as a function of time. Trials were separated by 750 ms. (B) Average peak amplitude of calcium transients (∆F/F) for single action potential (single AP). (C) Average decay (tau) for a single action potential for wild type (n = 10 boutons) and mctpOG9 (n = 12 boutons). (D) Average peak amplitudes of calcium transients (∆F/F) as in (B) for the short stimulus train (5X AP). (E) Average decay (tau) as in (C) for trains of five action potentials (5X AP). A remaining possibility is that MCTP is necessary for efficient coupling of calcium to vesicle release. To probe this possibility, we measured release in the presence of a slow calcium buffer. EGTA has a relatively slow calcium-binding rate (Smith et al., 1984) and has been used to probe the functional coupling of vesicle to sites of presynaptic calcium influx (Schneggenburger and Neher, 2005). 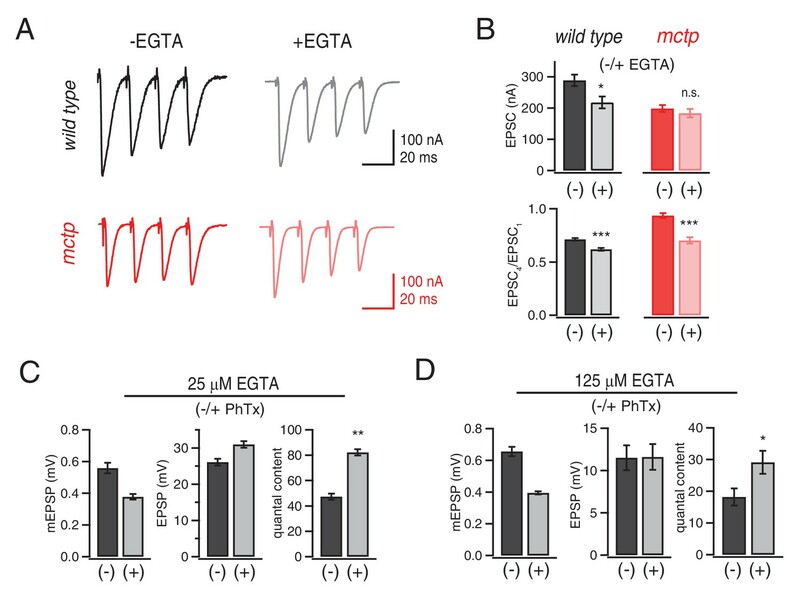 We tested the effects of EGTA-AM (25 μM or 125 µM) on single AP-evoked EPSCs and short-term release dynamics at 1.5 mM [Ca2+]e comparing wild-type and mctpOG9 mutant synapses (Figure 7). 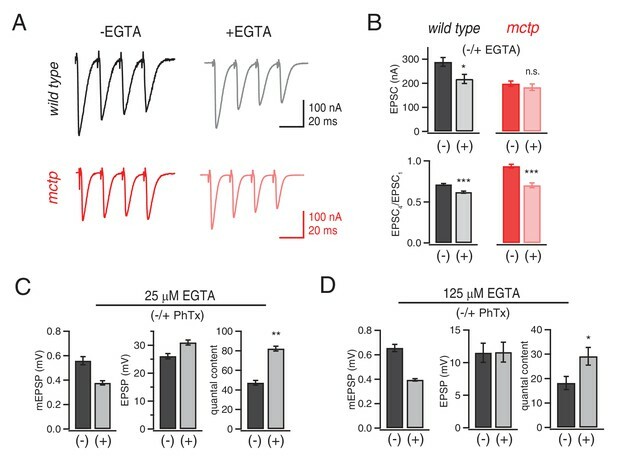 At the wild type synapse, the presence of EGTA-AM causes a significant decrease in EPSC amplitude. In contrast, EPSCs in mctpOG9 mutants are completely insensitive to EGTA-AM (Figure 7B). We note that EGTA-AM diminishes wild type EPSC amplitudes to precisely the levels observed in the mctp mutant in the absence of EGTA-AM. Since mctp is insensitive to EGTA-AM, we conclude that MCTP acts downstream of calcium influx to facilitate the release of an EGTA-sensitive vesicle pool during single action potential stimulation. Evidence that MCTP is necessary for the release of an EGTA-sensitive pool of synaptic vesicles. (A) Representative EPSC traces shown for wild type and mctpOG9 (black and red , respectively) in the absence and presence of EGTA-AM as indicated. (B) Average EPSC amplitudes and short-term modulation of EPSC amplitude (fourth EPSC / first EPSC) for wild type and mctpOG9 in the presence (+) or absence (−) of EGTA as indicated (sample size for wild type: (-EGTA) n = 12, (+EGTA) n = 11; for mctp: (-EGTA) n = 10, (+EGTA) n = 10). (C) Average mEPSP amplitude, EPSP amplitude and quantal content for wild type in the presence (+) or absence (−) of 25 µM EGTA, as indicated. Sample sizes as follows: -PhTx, n = 7; +PhTx, n = 4. (D) Recordings as in (C) performed in the presence of 125 µM EGTA-AM and the presence or absence of PhTx as indicated. Sample sizes as follows: -PhTx, n = 13; +PhTx, n = 15. During repetitive stimulation, intra-terminal calcium levels rise, which can enhance the recruitment of weakly coupled vesicles (Figure 7). In the mctpOG9 mutant, access to weakly coupled vesicles is impaired. Our estimates suggest that the RRP in mctp is normal, an effect that can be accounted for by pronounced facilitation during the early phase of the stimulus train (Figure 7). Indeed, repetitive stimulation reliably invokes facilitation in the mctp mutant. One interpretation is that the elevated intra-terminal calcium that occurs during repetitive stimulation overcomes impaired access to the weakly coupled vesicle pool caused by loss of MCTP. EGTA should buffer the slow rise in intra-terminal calcium during a stimulus train and, thereby, the calcium-dependent recruitment of weakly coupled vesicles. Thus, EGTA should convert facilitation to depression in mctp mutants. This is precisely what we observe. In wild type, application of EGTA-AM has little effect on short-term release dynamics. However, in mctp, short-term facilitation is converted to short-term depression (Figure 7A,B). Thus, we provide evidence that MCTP is necessary to promote the fusion of a sub-population of synaptic vesicles that are weakly coupled to sites of action potential induced presynaptic calcium entry. Finally, we asked whether the role of MCTP during PHP relies upon expansion of the MCTP-dependent, EGTA-sensitive vesicle pool. This appears not to be the case. In the presence of 25 µM EGTA-AM, the induction of PHP occurs normally (Figure 7C). Next, we increased the concentration of EGTA five-fold (125 µm), keeping the incubation time for EGTA-AM constant. In this condition, baseline release is significantly impaired, reducing quantal content by ~50%. None-the-less, we observe statistically significant PHP, although it is suppressed relative to controls in the absence of EGTA-AM (Figure 7D). Thus, PHP does not require the MCTP-dependent, EGTA-sensitive vesicle pool. MCTP appears to have an additional activity that is necessary for PHP. We next considered the effects of external calcium on the expression of PHP. In wild type animals, PHP is fully expressed across a >15-fold change in extracellular calcium, from 0.3 mM to 15 mM (Müller et al., 2015). This is particularly remarkable when one considers that PHP is an accurate form of compensation, precisely offsetting the postsynaptic impairment of glutamate receptor function. In other words, PHP can precisely offset a 50% reduction in glutamate receptor function over a >15-fold range of extracellular calcium. There are many non-linear process that are combined in the calcium-coupled release process, particularly over such a large range of extracellular calcium (Zucker and Regehr, 2002). Therefore, it is truly remarkable that homeostatic plasticity can remain a constant fraction of total release over this calcium range. We assayed PHP over a range of extracellular calcium (0.3 mm to 1.5 mM [Ca2+]e), comparing wild type and mctpOG9 mutants using two-electrode voltage clamp measurement of synaptic currents. Consistent with prior evidence, in wild type animals, PHP is normally expressed at all extracellular calcium concentrations tested (Figure 8). However, mctp mutants revealed calcium sensitive expression of PHP. The physiological range for extracellular calcium at the Drosophila NMJ is considered to be 0.7–2.2 mM (Stewart et al., 1994). At low extracellular calcium (0.3 mm and 0.5 mM [Ca2+]e), PHP is completely blocked in mctpOG9 (Figure 8, see also Figures 1 and 2). When [Ca2+]e is elevated into the physiological range (0.7 mM and 1.0 mM [Ca2+]e), PHP remains blocked (Figure 8C). Only when [Ca2+]e is increased into the higher end of the physiological range (1.5 mM [Ca2+]e) is PHP expressed in mctpOG9. We propose that MCTP normally functions to ensure that PHP is robustly and accurately expressed under variable [Ca2+]e conditions. To do so, MCTP must have a profound ability to counter changes in extracellular calcium and ensure robust doubling of presynaptic release in the presence of PhTx. MCTP ensures that PHP is robust to variations in extracellular calcium. (A) Representative EPSC traces for wild type (black) and mctpOG9 (red) at the indicated extracellular calcium concentrations, in the absence (−) and presence (+) of PhTx. Scale bar: 20 nA, 5 ms. (B) Average quantal content quantified at indicated calcium concentrations for wild type (black) and mctpOG9 (red). (C) Average quantal content for wild type (black/gray) and mctpOG9 (red/light red) in the absence and presence of PhTx at the indicated extracellular calcium concentrations. Sample sizes are shown for each calcium concentrations (mM) 0.3, 0.5, 0.7, 1.0 and 1.5, respectively: wild type (-Phtx) n = 10, 13, 6, 16, 12; wild type (+Phtx) n = 9, 12, 9, 7, 8. mctp (-Phtx) n = 8, 10, 14, 12, 9; mctp (+Phtx) n = 8, 10, 9, 6, 10. Statistical significance as indicated: Student’s t-test * for p<0.05; ** for p<0.01, n.s. for p>0.05. It remains possible that the effects of MCTP on baseline release and PHP could be mediated by changes in the number or distribution of synaptic vesicles at individual active zones. To address this possibility, we visualized active zones using transmission electron microscopy according to published methods (Harris et al., 2015). We find no change in active zone ultrastructure or vesicle distribution in mctp (Figure 9). There is no change in vesicle diameter, indicative of normal vesicle recycling at this synapse (Poskanzer et al., 2006). There is no change in the average number of vesicles per active zone, nor is there a change in the average vesicle distance from the center of the presynaptic T-bar, the site where presynaptic CaV2.1 calcium channels reside (Figure 9D–F). These data are consistent with our electrophysiological data revealing a normal RRP in the mctp mutant (Figure 5). Finally, there is no change in the absolute length of the active zone, defined as the electron dense pre- and postsynaptic membranes that flank either side of a T-bar (Harris et al., 2015) (Figure 9C). Thus, under these conditions, altered release is not correlated with a change in presynaptic ultrastructure in mctp. Again, MCTP must have an additional action, downstream of calcium influx that is necessary for normal PHP and baseline release. Normal active zone ultrastructure in the mctp mutant. (A–B) Representative electron microscopy images of an active zone from wild type (A) and mctpOG9 (B). (C–F) Average active zone length (C), vesicle diameter per active zone (D), average vesicle distance to T-bar (E) and the average number of vesicles within 150 nm of the presynaptic T-bar (F). Sample sizes as follows: number of active zones in wild type, n = 19; mctp, n = 16; sections from at least two NMJ in two separate animals. Student’s t-test * for p<0.05; ** for p<0.01, n.s. for p>0.05. It was previously demonstrated that all three C2 domains of MCTP bind calcium (Shin et al., 2005). To determine whether the calcium-coordinating residues in C2A, C2B and C2C domains are necessary for PHP, we mutated all of the predicted calcium coordinating residues from aspartic acid to asparagine. There are five critical residues predicted to be necessary for calcium coordination in C2A, two in C2B and five in C2C. Four mutant transgenes were generated. The first transgene included mutations in all twelve residues, termed mctpC2D12N, which is predicted to render the MCTP protein unable to coordinate calcium in any of the three C2 domains. Then, we generated transgenes in which single C2 domains were mutated, termed mctpC2A*, mctpC2B* and mctpC2C*. These transgenes were expressed under UAS-control in neurons (elav-Gal4) in the mctpOG9 mutant background. Each transgene was epitope tagged, allowing us to follow the distribution of the over-expressed protein to ensure proper trafficking and localization of the mutant transgenes compared to the wild type epitope tagged transgene. Each transgene was confirmed by direct sequencing. We find that neuronal expression of UAS-mctpC2D12N fails to rescue PHP in the mctp1 mutant and does not impair release beyond that observed in the mctp1 mutant alone (data not shown). Given this, we tested the transgenes harboring mutations in individual C2 domains. First, we demonstrate that each mctp transgene (mctpC2A*, mctpC2B* and mctpC2C*) is well expressed and is distributed throughout the presynaptic terminal (Figure 10A). Compared to expression of wild type mctp-flag (Figure 10A top left), expression of both mctpC2B*-flag and mctpC2C*-flag show normal abundance and distribution within the presynaptic terminal. Expression of mctpC2A*-flag is qualitatively less abundant, but it does traffic to the presynaptic terminal where it appears to be normally distributed. All transgenes are inserted at a common genomic site, suggesting that these differences in protein distribution are not caused by differences in transgene expression. None-the-less, since all three transgenes are present at the NMJ, it argues that these transgenic proteins do not dramatically alter the ER membrane system and the extension of this membrane system to the presynaptic terminal. With this information in hand, we tested PHP and find that all three transgenes fail to rescue PHP in the mctpOG9 mutant background (Figure 10B,C). There is no increase in quantal content in mctp mutants expressing either UAS-mctpC2A* or UAS-mctpC2C*. There is a trend toward increased quantal content in animals expressing UAS-mctpC2B*, but this fails to reach significance. We conclude that MCTP functions as an ER-resident calcium sensor that is necessary for PHP. Since PHP requires calcium-coordinating residues in all three MCTP C2 domains, we propose that MCTP functions as a presynaptic calcium sensor and a source of calcium-feedback signaling to ensure robust expression of PHP. Evidence that MCTP is an ER localized calcium sensor. (A) Representative images of the NMJ showing the expression of epitope tagged mctp transgenes (UAS-mctp-Flag). At top (black and white) are images of MCTP-Flag at the NMJ. Below, staining is shown for MCTP (green) and anti-Dlg (red). Sequentially, moving to the right are images for expression of mutant UAS-mctp-flag transgenes in the mctpOG9 mutant background. Each transgene harbors mutations in an individual C2 domain, either in the C2A domain (C2A*), the C2B domain (C2B*) or the C2C domain (C2C*, at far right). In all cases, the elav-Gal4 driver is used to express transgenes in neurons in the mctpOG9 mutant. (B) Average percent changes in mEPSP amplitude (filled bars) and quantal content (open bars) for the indicated genotypes (mctp, mctpC2A*, mctpC2B*, mctpC2C*) in the presence of PhTx compared to baseline. (C) Quantification of mEPSP amplitudes and quantal content for mctp (-PhTx, n = 10; +PhTx, n = 10), mctpC2A* (-PhTx, n = 14; +PhTx, n = 8), mctpC2B*(-PhTx, n = 6; +PhTx, n = 9), mctpC2C* (-PhTx, n = 14; +PhTx, n = 10). Student’s t-test ** for p<0.01, * for p<0.05, n.s. for p>0.05. Here we provide evidence that MCTP is an ER-resident calcium sensor that promotes the release of a population of weakly coupled synaptic vesicles and drives robust expression of PHP. We demonstrate that loss of MCTP does not alter the spatially averaged presynaptic calcium signal in response to single or repetitive nerve stimulation. Thus, MCTP functions downstream of cytosolic calcium originating from either plasma membrane calcium channels or ER calcium stores. Prior evidence suggests that MCTP is sensitive to calcium in the 1 µM range (Shin et al., 2005). As such, MCTP could ‘sense’ action-potential induced calcium influx or residual calcium following an action potential. Prior evidence also indicates that MCTP does not bind membrane lipids (Shin et al., 2005). This does not rule out the possibility that MCTP could confer calcium sensitivity to the protein complexes that mediate an interaction of ER membranes with plasma membranes at or near presynaptic release sites. A recent paper has underscored the role of axonal ER in the regulation of presynaptic release (de Juan-Sanz et al., 2017). In this work, depletion of ER calcium strongly suppresses presynaptic release in a STIM1-dependent manner (de Juan-Sanz et al., 2017). However, STIM-1 knockdown was shown to have no effect on baseline transmission under normal physiological conditions (de Juan-Sanz et al., 2017). By contrast, our work specifies a role for ER-localized MCTP as a critical regulator of baseline release, short-term plasticity and PHP, under physiological conditions. Loss of MCTP appears to have two separable effects on presynaptic release. On the one hand, loss of MCTP impairs presynaptic vesicle release across a 3-fold range of extracellular calcium (0.5–1.5 mM [Ca2+]e). This represents a shift in the calcium sensitivity of release without a change in the calcium-dependent cooperativity of release. We further demonstrate that loss of MCTP causes increased short-term facilitation. This effect is generally associated with decreased presynaptic release probability. Indeed, there is no change in stimulus-dependent RRP size or synaptic ultrastructure. However, there is also no change in the spatially averaged calcium signal in response to single or repetitive action potential stimulation. Rather, it appears that MCTP controls access to an EGTA-sensitive component of presynaptic release, also termed ‘weakly calcium-coupled vesicles’. It is worth noting that the magnitude of the decrease in baseline release in mctp under physiological calcium conditions is quantitatively similar to that observed in mutations deleting Rab3-Interacting Molecule (RIM; Müller et al., 2012), a presynaptic component of the active zone cytomatrix (Südhof, 2012). As such, the effects of mctp mutants are dramatic and consistent with emerging evidence that presynaptic ER signaling is a potent regulator of synaptic transmission (de Juan-Sanz et al., 2017). MCTP is also required for the expression of PHP. Unlike the effects on baseline release, which occur over a range of 0.5 to 1.5 mM [Ca2+]e, the block of PHP in the mctp mutant occurs when extracellular calcium concentration is diminished below 1.5 mM [Ca2+]e. The physiological range for extracellular calcium at the Drosophila NMJ is considered to be 0.7–2.2 mM (Stewart et al., 1994). It is remarkable, therefore, that PHP can be both accurate and robust when recordings are made at 0.3 mM [Ca2+]e at a wild type synapse. One possibility is that MCTP functions as part of a calcium-dependent feedback signaling system that stabilizes the expression of PHP. Since PHP can be induced in the absence of action potential induced presynaptic calcium influx (Frank et al., 2006), MCTP would need to be sensitive to changes in extracellular calcium, presumably detecting corresponding changes in cytoplasmic calcium since MCTP resides on the internal ER membranes. In the mammalian central nervous system, there is considerable evidence that extracellular calcium concentrations can be substantially diminished, well below the physiological range (hypocalcaemia) during periods of normal neural activity or as a consequence of disease (Lu et al., 2010; Borst and Sakmann, 1999; Silver and Erecińska, 1990). As such, MCTP-dependent stabilization of PHP could be an essential mechanism to prevent the failure of synaptic transmission at neuromuscular and, possibly, central synapses under convergent conditions of hypocalcaemia and homeostatic stress. One possibility is that MCTP-dependent signaling occurs at sites of ER-plasma membrane contact. This is consistent with the demonstration that the ER-plasma membrane interface is controlled in a calcium-dependent manner in other cell types. For example, the eSyts (Idevall-Hagren et al., 2015; Saheki et al., 2016; Giordano et al., 2013) and orthologous Tricalbins in yeast (Manford et al., 2012; Toulmay and Prinz, 2012) are calcium sensitive molecular tethers that control the extent of ER-plasma membrane contact. One action of the eSyts is to control plasma membrane lipid homeostasis through the action of their SMP domain (Saheki et al., 2016; Schauder et al., 2014). This represents a homeostatic system that controls plasma membrane phospholipid composition (Saheki et al., 2016). MCTP lacks an SMP domain, but this does not rule out the possibility that MCTP functions as part of a related protein complex that mediates such an activity. As another example, it has been established that oligomerization of the ER-resident protein STIM1 occurs in response to lowered levels of calcium within the ER, triggering its interaction with and activation of the plasma membrane calcium channel Orai1. This represents a calcium-dependent signaling system that sustains calcium levels in the ER lumen (Feske et al., 2006; Zhang et al., 2005; Liou et al., 2005) and has been recently linked to the regulation of presynaptic release under conditions of ER calcium depletion (de Juan-Sanz et al., 2017). It is worth noting that ER-plasma membrane contact sites exist prior to calcium-dependent STIM1 recruitment, an observation that has highlighted the importance of ER-plasma membrane contact sites as platforms for other signaling events (Giordano et al., 2013; Anderie et al., 2007; Stefan et al., 2011, 2013). It is also worth noting that proteins resident at ER-plasma membrane contacts are not always selectively localized to these sites (Giordano et al., 2013), an observation that is consistent with the observed distribution of MCTP throughout the ER in neurons. It remains to be determined whether loss of MCTP disrupts ER-plasma membrane contacts in the presynaptic terminal and whether these hypothetical sites are controlled in a calcium dependent manner via MCTP activity. Indeed, the observation that C2-domain specific mutations in MCTP block PHP without dramatically altering the distribution of MCTP-labeled ER membranes within the presynaptic terminal argues against the simple possibility that MCTP controls PHP by organizing ER morphology. It seems more likely that MCTP could confer calcium-dependence to signaling between the ER and other internal membrane systems. Without question, there are many experiments that could be performed to pursue these ideas. None-the-less, we provide strong evidence that MCTP is a calcium sensor that acts downstream of calcium influx to stabilize baseline release and confer robustness to the expression of PHP. Disruption of the extended neuronal endoplasmic reticulum has been repeatedly associated with neurological disease. For example, the spastic paraplegias are genetic disorders that include degeneration of upper motoneurons (Blackstone et al., 2011). Among the more than 70 gene mutations responsible for this disease are mutations in the gene encoding ER-resident proteins Atlastin1 and Reticulon2. A recent study demonstrated that RNAi-mediated knockdown of either gene in Drosophila motoneurons causes ER fragmentation, decreased neurotransmitter release and altered synaptic morphology (Summerville et al., 2016). Other recent studies have examined mutations in Drosophila spastin, spartin and spichthyin, all of which disrupt the integrity of the ER membrane system (Nahm et al., 2013; Ozdowski et al., 2011; Sherwood et al., 2004; Wang et al., 2007). Each of these mutations also disrupts synaptic morphology, alters the microtubule cytoskeleton and cause defects in synaptic transmission. There are notable and important differences compared to our observations of mctp mutants. First, homeostatic plasticity was not tested in these prior studies, so a direct comparison cannot be made. Second, we did not observe changes in ER organization in the mctp mutant and the microtubule cytoskeleton is unaltered in mctp. Third, there is no substantive change in NMJ growth, organization or changes in synaptic ultrastructure caused by loss of mctp. Finally, we extend our work to the analysis of calcium-coordinating residues in the individual C2 domains of MCTP and demonstrate that the distribution of C2-domain mutations are largely normal, implying that PHP is blocked while the ER membrane system remains intact. In this respect, it is very intriguing that mutations in human mctp were recently associated with psychiatric disease in humans (Djurovic et al., 2009; Scott et al., 2009). Bipolar disorder can be considered a disease of neuronal malfunction that could reasonably be related to the role of MCTP in the homeostatic stabilization of synaptic transmission. Drosophila stocks were raised at 25°C on standard food. The w1118 strain is used as the wild-type control unless otherwise noted because this is the genetic background of the transgenic lines used. Both mctp1 and mctp2 were obtained from the Bloomington Drosophila Stock Center (Bloomington, IN). mctp1 was the initial mutant isolated from the synaptic homeostasis screen (Dickman and Davis, 2009), and is a piggybac transposon insertion (Pbace00415) residing in the 3’ UTR. mctp2 is a minos transposon insertion (MI102901) in a coding exon of the mctp gene. All other Drosophila stocks were obtained from the Bloomington Drosophila Stock Center unless otherwise noted. For pan-neuronal expression of mctp transgenes and presynaptic rescue, we used the elavc155-Gal4 driver. The myosin heavy chain driver (MHC-Gal4) was used for postsynaptic rescue. Standard second and third chromosome balancers and genetic strategies were used for all crosses and for maintaining mutant lines. Third-instar larvae were dissected, fixed in Bouin’s fixative or 4% PFA in PBS, and immunostained as previously described (Eaton et al., 2002; Harris et al., 2015). Dissected third instar larvae were fixed with PFA (4%) and incubated overnight at 4 C with primary antibodies (mouse anti Flag 1:50; rabbit anti-RFP 1:100; rabbit anti-Dlg, 1:1000; anti-Syt1 1:1000, anti-Brp 1:100, Life Technologies). Alexa-conjugated secondary antibodies and goat anti-HRP were used (Jackson Laboratories 1:500). Images were acquired with either a Zeiss LSM700 confocal microscope equipped with Zen software using a 63X 1.6 NA oil immersion objective or an upright epifluorescence deconvolution confocal microscope (Axiovert 200, Zeiss) equipped with a 100X objective (N.A. 1.4), cooled CCD camera (CoolSnap HQ, Roper Scientific). Slidebook 5.0 (3I, Intelligent Imaging) was used for capturing, deconvolving and analyzing images. Structured illumination microscopy (Nikon LSM 710 equipped with 63X objective and Andor Ixon EMCCD camera) was used to perform Brp-GFP and MCTP-Flag colocalization experiments. Bouton numbers and Brp numbers and densities were quantified as described previously (Harris et al., 2015). Current clamp and two-electrode voltage clamp recordings were done from muscle six, at the second and third segment of the third-instar Drosophila with Axon 2B or an Axoclamp 900 amplifiers (Molecular Devices). The extracellular solution (HL3) included (in mM) 70 NaCl, 5 KCl, 10 MgCl2, 10 NaHCO3, 115 sucrose, 4.2 trehalose, 5 HEPES. Ca2+ was added to the HL3 at the day of the experiment at different concentrations (0.3 to 1.5 mM). Homeostatic plasticity was induced by incubating the larvae with Philantotoxin-433 (PhTx, 15–20 µM, Sigma) for 10 min as previously described (Frank et al., 2006; Harris et al., 2015). EGTA-AM was diluted in calcium-free HL3 to its final concentration (25 and 125 µM, Sigma), applied to the unstretched larvae for 10 min of incubation. Quantal content was calculated by dividing average EPSP to mEPSP. For estimating the pool size, cumulative peak EPSP amplitudes at 60 Hz were line-fitted and back-extrapolated to time = 0 (Schneggenburger et al., 1999). mEPSPs were analyzed with MiniAnalysis program (Synaptosoft). All other physiology data were analyzed with custom written functions in Igor 6 (Wavemetrics Inc). Calcium imaging was performed as previously described (Müller and Davis, 2012; Müller et al., 2015). Final stocks of OGB-1 488 (1 mM, Sigma) and Alexa-568 (5 mM, Sigma) were prepared in HL3 (0 mM Ca2+). Third instar Drosophila larvae was dissected and incubated on ice for 10 min in HL3 with zero calcium (1 mM OGB-1; 5 mM Alexa 488, Invitrogen). Indicators were removed and larvae were washed for 10 min with HL3, then placed into the recording chamber for imaging. A scanning confocal microscope (Ultima, Prairie Technologies) with a 60× objective (1.0 NA, Olympus) was used for imaging. 488 nm excitation wavelength from a krypton-argon laser used for excitation and emitted photons were collected through a pinhole at a photocathode photomultiplier tube (Hamamatsu). All line scans were performed at type 1b boutons of muscle 6/7, segments A2-A3. Loading efficiency of the dye was assessed by the intensity of co-loaded Alexa 568. Single stimuli (1 ms) and stimulus trains (5 pulse, 1 ms duration, 50 Hz) were used. Changes in the fluorescence were quantified as previously described (Müller and Davis, 2012; Müller et al., 2015). Electron microscopy was performed as previously described (see Harris et al., 2015). Two partial mctp cDNA sequences were obtained as cDNA clones from the Berkeley Drosophila Research Consortium, IP11216 and RE18318 (www.bdgp.org). Standard PCR methods were used to amplify overlapping cDNA sequences from these clones. These sequences were then used in a duplex PCR reaction to generate the full length Drosophila mctp open reading frame. This full length mctp cDNA was then cloned into the pENTR vector (Gateway Technology, Invitrogen) by engineering a CACC sequence in the forward primer (caccATGTCACGCATCCAATACGTTG) and using a reverse primer, with or without a stop codon (CTATGATCCTTTCAGTTTCTTCTT, TGATCCTTTCAGTTTCTTCTTGG) to amplify the full length mctp open reading frame, which was used in subsequent Gateway reactions. To generate the C2 domain mutations, we used PCR site-directed mutagenesis. Amino acids 233, 239, 286, 288, and 294 were changed from D to N in mctpC2A. Amino acids 387 and 393 were changed from D to N in mctpC2B. Amino acids 534, 540, 586, and 588 were changed from D to N and amino acid 594 was changed from E to N in mctpC2C. All constructs were cloned into the proper destination vector (pUASt-mctp alone or pUASt-mctp-3xFlag) obtained from the Drosophila Gateway Vector Collection (Carnegie Institution, Baltimore, MD), and sequenced. Targeted insertion of the mutant transgenes into the Drosophila genome (PhiC31 integrase-mediated injection) was achieved using the services of BestGene, Inc (Chino Hills, CA). For Crispr gRNA flies, three gRNA sequences were selected using the CRISPR optimal target finder website (http://tools.flycrispr.molbio.wisc.edu/targetFinder). These sequences were cloned into the pCDF3-dU6:3 gRNA vector (Addgene plasmid #49410, Simon Bullock). Transgenic animals harboring the gRNA vector were generated using standard PhiC31 integrase-mediated injection methods (BestGene). These flies were used to generate mutations in the mctp gene locus in combination with transgenically expressed Cas9 at the germline (Kondo and Ueda, 2013). Single lines were generated and sequenced. A single mutation was selected (mctpOG9), described in the main text. Drosophila S2 cells (obtained from the Vale laboratory, UCSF with additional source information at http://flybase.org/reports/FBtc9000006.html) were grown in Schneider’s Drosophila medium (Life Technologies) and transfected by Effectene (Qiagen). After 48 hr, cells were plated onto the coverslip coated with ConA. For live ER imaging, cells were incubated with red ER-Tracker (Thermofisher) for 30 min and washed with HL3. Images were collected with a Yokagawa CSU22 spinning disk confocal microscope equipped with 100X objective. Cells are mycoplasma negative (tested by MycoAlert, Lonza, 2017). The Journal of Physiology 521 Pt 1:123–133. Integrative and Comparative Biology 54:223–237. The Journal of Physiology 299:621–638. Annual Review of Physiology 77:251–270. Annual Review of Neuroscience 29:307–323. The Plant Cell Online 21:1632–1636. Current Opinion in Neurobiology 15:266–274. Journal of Biological Chemistry 280:1641–1651. The Journal of General Physiology 95:837–866. Current Opinion in Cell Biology 25:434–442. Journal of Comparative Physiology A 175:179–191. Journal of Cell Science 129:1635–1648. Journal of Cell Science 125:49–58. Annual Review of Neuroscience 34:89–103. Annual Review of Physiology 64:355–405. Thank you for submitting your article "MCTP is an ER-Resident Calcium Sensor that Stabilizes Synaptic Transmission and Homeostatic Plasticity" for consideration by eLife. Your article has been reviewed by three peer reviewers, and the evaluation has been overseen by a Reviewing Editor and Richard Aldrich as the Senior Editor. The following individual involved in review of your submission has agreed to reveal his identity: Bing Zhang (Reviewer #2). Based on the reviews as well as subsequent discussions among the reviewers, we would like to invite you to submit a revised manuscript. From the reviews below, you will see that a common concern is that it is inadequate to determine the subcellular localization of MCTP based on overexpressed proteins. This should be determined by antibody against endogenous protein, or MiMIC or CRISPR/Cas9-produced tag of endogenous protein. We also expect that you will respond to other critiques of the reviewers as thoroughly as possible with new data (e.g., potential artifact of ER localization caused by fixation; testing new Ca2+ buffer). Where it is not possible, please tone down the assertions based on available data. The last 15 years have seen a marked increase in our knowledge of presynaptic homeostatic plasticity (PHP), largely driven by studies from the Davis lab at the fly NMJ. However, the molecular underpinnings of these events are incompletely known. In this manuscript, Genc and colleagues identify MCTP, a C2-domain containing transmembrane protein, as a new player involved in PHP. It is necessary for both acute and chronic invocations of PHP as well as coordination of PHP over a wide range of calcium concentrations. MCTP localizes broadly throughout nerves, and overlaps somewhat with KDEL, suggesting that it localizes (though not exclusively) to the ER. Beyond its involvement in PHP, MCTP also plays a role in baseline neurotransmission, allowing access to a pool of weakly coupled, EGTA-sensitive vesicles, which may also factor into PHP, though the link is somewhat murky. Perturbation of MCTP does not affect morphology or vesicle parameters at the NMJ. Finally, the authors demonstrate that all three C2 domains of the protein are necessary for PHP, suggesting that the calcium-binding activity of MCTP is what drives its role in PHP. The experiments are well done, the physiology well controlled, and the data (largely, see below) very strong. There is some question, however, as to how the roles of MCTP regarding PHP and the weakly coupled vesicle population are connected and how separable are the functions of MCTP in baseline transmission and PHP. As such, the mechanistic insight offered by this new player into how PHP functions is limited. The feedback system, as suggested by the authors, is a tantalizing prospect, though more insight into that mechanism would be necessary to elevate this paper to eLife. This is an excellent analysis of a new PHP player that would be better suited for a specialty journal. I am, however, concerned about the conclusions regarding MCTP overexpression. Due to the widespread localization, it is likely to partially colocalize with many markers. So co-staining with Syt, Brp, and HRP is only mildly informative. The KDEL staining is convincing in the segmental nerves (though again, overexpressed), but doesn't match informatively at the NMJ. Thus, I wonder if overexpression causes mislocalization. I would recommend qPCR to compare overexpression levels with those of endogenous. If they are vastly different, identify expression conditions that most closely resemble WT. That would allow for more confidence regarding the localization. Further, commercial KDEL antibodies exist as well as monoclonals to Drosophila Golgi and ER proteins (Riedel et al., 2016, Biology Open) that might be helpful to avoid concomitant KDEL overexpression. In the mctp mutants, the AP waveform is unchanged, but is calcium influx (the currents themselves) is affected? It seems important to know, given the assertions made later on regarding slow calcium buffering with the EGTA experiments. I'm particularly intrigued by the change from short-term depression to facilitation in mctp in Figure 5. The same change doesn't appear in Figure 7. Rather, it looks like the level is maintained: is the change only present at certain frequencies? Calcium concentrations? The differences could be made clearer. Or perhaps a more representative trace used? Regarding the interpretation of MCTP function, the presence of PHP at high extracellular calcium levels in mctp is interesting. In this case, the calcium driving force is greater, likely overloading normal buffering, or at least slowing it. This would alter the average extra / intra calcium ratio. Is it possible that MCTP is, instead of detecting extracellular calcium, detecting influx, clearance, or extrusion rates from other buffering mechanisms, like PMCA or SERCA? Calcium imaging of transients at high calcium levels may shed some light on the mechanism by which MCTP might work as a sensor. This could further enlighten a mechanistic role. This is an interesting and original study on identification of a presynaptic molecule that plays a key role in homeostatic synaptic plasticity. The author identified an ER- multi-domain Ca sensor from a large scale genetic screen and presented strong electrophysiological evidence that MCTP acts downstream of Ca influx to facilitate the expression of presynaptic compensatory increase in quantal release upon a reduction in postsynaptic glutamate receptors. This work extends previous findings from the Davis lab and appears to add a new presynaptic molecule to the network of proteins involved in homeostatic regulation. 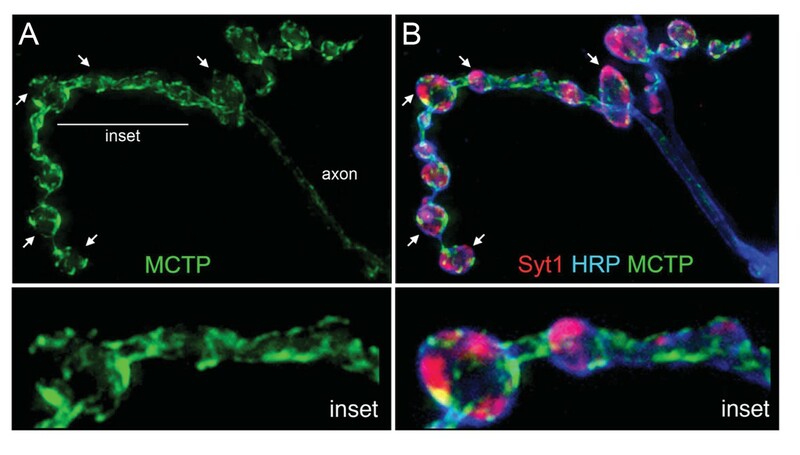 What makes this report more interesting is that MCTP is a synaptotagmin-like Ca sensor and localized in presynaptic termini, close to the active zones, to regulate presynaptic release. The data presented in this manuscript are solid and the interpretations are reasonable. 1) One of my suggestions is to move Figure 10 to Figure 2 so that the authors can show the structure-function in the context with presynaptic rescue. This is minor. 2) The facilitation experiment comparing EPSP4 /EPSP1 ratio in Figure 5 is consistent with the observation that the basal release at the mctp mutant NMJs is reduced. A better comparison would be to adjust the extracellular [Ca] such that the initial EPSC is similar for both the wild type and mctp mutant. 3) The EGTA experiment is intriguing, and I wonder how does this compare with a fast Ca chelator such as BAPTA-AM? 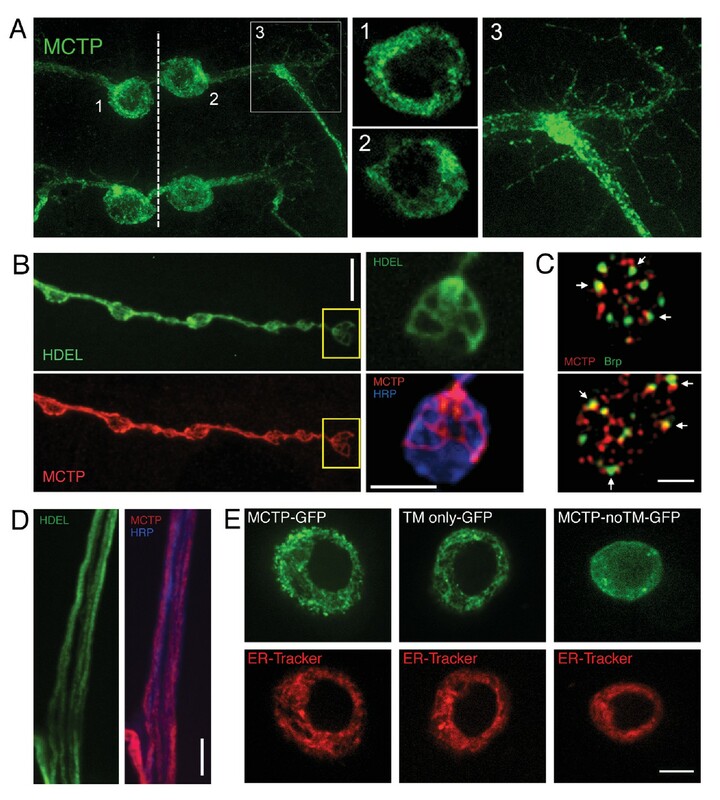 In this study, Genc and colleagues report the isolation of a putative smooth ER protein, mctp, which when mutated blocks presynaptic homeostatic plasticity. They postulate that mctp is associated with the smooth ER, which has been previously shown to span the entire neuron, from cell body to synaptic terminals to dendrites. They show that the protein is in close proximity to the plasma membrane and sometimes apposed to active zones. In addition, they provide evidence, including mutations in the C2 domains and alterations in calcium levels, that mctp is likely to function downstream of calcium influx into the cell. They propose that mctp is a calcium sensor that serves to stabilize base transmission and homeostatic plasticity as a function of postsynaptic excitability. These observations are significant as we still know little about the mechanisms of homeostatic plasticity. My main concerns were two-fold, and while they do not detract from most of the main findings in the paper, they do introduce an element of over-interpretation and they should be corrected. 1) As has been previously reported, chemical fixation destroys the integrity of the ER in this system (Summerville et al. 2016). Therefore all statements regarding the localization of the mctp signal near the plasma membrane of the terminals, or the localization at ER regions apposed to active zones is in question. Reagents to look at the ER in unfixed preparations are available. 2) Overexpression of mctp is used to determine the localization of the protein, which is not acceptable, especially given the availability of tools to look at this without overexpression or antibodies (e.g., introduction of a tag into the genomic locus via CRISPR). The arguments presented to argue for overexpression of mctp reflecting the endogenous localization of the protein are not valid as presented (e.g., lack of aggregation of the label might be meaningless as to the normal localization of the protein; that the tagged protein rescues phenotypes can also be meaningless as to protein localization. For example, sufficient amounts of mctp-flag might be present at appropriate locations to rescue abnormal phenotypes, even if mctp-flag overflows to additional sites; the argument that mctp has similar transmembrane domains as another ER protein is also a very weak argument). 3) Another criticism is about the inappropriate interpretation of the statistical analysis. At least in 3 occasions authors point to "a trend (difference in the mean)" even when the statistical analysis says that a difference between the samples cannot be determined at 95% confidence. Further, the authors go on to discuss the significance of the "trend", which is overstretching the data. Thank you for resubmitting your work entitled "MCTP is an ER-Resident Calcium Sensor that Stabilizes Synaptic Transmission and Homeostatic Plasticity" for further consideration at eLife. Your revised article has been favorably evaluated by Richard Aldrich (Senior editor), a Reviewing editor and two reviewers. As you see, Reviewer #1 raised the caveat of accessing the protein localization purely based on overexpressed protein, which in fact was an issue we highlighted in editorial comments to the original submission. Although your rebuttal cited examples that overexpressed proteins reflect the localization of endogenous proteins, this is not guaranteed for a novel protein. We recognize that the revised manuscript contains a lot of new data, and after discussions among reviewers, we agree that the manuscript is acceptable for publication if you clearly point out the limitations of using overexpressed protein to infer the localization of an endogenous protein. In this revision, Genc and colleagues have added data regarding the localization of overexpressed MCTP. They conduct co-staining with an overexpressed ER marker (HDEL-GFP) in vivo under live imaging conditions to preserve ER morphology. They also utilize cell culture assays to perform structure-function localization of MCTP. These definitely enhance the paper, and provide further information to support their thesis. Moreover, it provides very useful data regarding the portions of the protein necessary for localization and nicely compliments the analysis regarding the C2 domains and function. I thank them for their additions. However, they do not address the fundamental criticism that all reviewers raised, in that these are overexpressed proteins. The live imaging improves morphology and resolution while further lending credence to their assertions. And though overexpressed protein CAN localize properly, it is not a definite that it will. The colocalization with HDEL-GFP is very encouraging (though itself overexpressed), the conclusions are limited by not directly assessing the endogenous proteins. I was the most positive one on the last round and I am pleased with the revisions made by the authors. I believe this version addressed most of the questions raised earlier and should be ready for publication in eLife. Regarding the general significance of our findings: We would like to emphasize that our paper defines the function of a new calcium-binding protein that affects presynaptic neurotransmitter release and homeostatic plasticity. We consider it even more striking that this is an ER-localized protein. We draw attention to the recent work on presynaptic ER calcium signaling in neurons, including recent work publish in Neuron (Juan-Sanz et al., Neuron 2017), now cited in our study. What distinguishes our work from the existing literature is that we not only identify a novel presynaptic calcium sensor (something remarkable given the long history of the field of synaptic biology), we also place this protein within the presynaptic ER. Thus, we define a new signaling function of the presynaptic ER. Finally, we demonstrate that this protein is a component of the regulatory mechanisms responsible for presynaptic homeostatic plasticity and baseline neurotransmitter release under normal physiological conditions. We would like to emphasize that recent work by Juan-Sanz et al., (Neuron2017) demonstrated that depletion of ER calcium causes a suppression of neurotransmitter release in a Stim1-dependent manner. But, they show that, under normal conditions, Stim1 knockdown had no effect on baseline release. Our work defines MCTP as essential controller of release and plasticity under normal physiological conditions. The experiments are well done, the physiology well controlled, and the data (largely, see below) very strong. There is some question, however, as to how the roles of MCTP regarding PHP and the weakly coupled vesicle population are connected and how separable are the functions of MCTP in baseline transmission and PHP. As such, the mechanistic insight offered by this new player into how PHP functions is limited. a) At 1.5mM extracellular calcium, baseline release is significantly impaired but PHP is fully expressed. Under this condition, the effects are separable. b) PHP fails in mctp mutants as extracellular calcium concentrations are decreased, but baseline release is impaired throughout the calcium range. c)EGTA-AM normalizes baseline release in wild type and mctp, consistent with the conclusion that MCTP is responsible for a weakly coupled vesicle pool. But, EGTA-AM does not block PHP. Again, the effects are separable. d) Mutations in the three C2 domains of MCTP fail to rescue PHP, but have no effect on baseline transmission compared to the wild type MCTP transgene. Again, the effects are separable. Thus, it is a conservative conclusion to suggest that MCTP has ‘separable’ effects on baseline release and PHP. We would also like to emphasize the extent of the information that we provide. We provide strong evidence for how baseline neurotransmission is disrupted (inclusive of EM, calcium imaging, pharmacology and numerous electrophysiological experiments). We also provide strong evidence that MCTP is a novel, presynaptic calcium binding protein necessary for PHP (inclusive a structure function analysis of all three MCTP C2 domains). Finally, with regard to the intersection of baseline neurotransmitter release and PHP, there are a number of additional points worth making. First, mutations that affect baseline release do notpredict a parallel disruption of PHP. This has been repeatedly demonstrated in the results of our genetic screens and published work (Frank et al., 2006; Frank et al., 2009; Dickman and Davis, 2009; Younger et al., 2013; Goold et al., 2007). Conversely, PHP can be blocked by mutations that have no effect on baseline transmission (Frank et al., 2009; Younger et al., 2013; Wang et al., 2014). Baseline release and PHP are genetically separable processes.Indeed, PHP seems to be a regulatory process that is layered on top of the presynaptic fusion apparatus (Davis and Muller, 2015). There are points of convergence between PHP and the release mechanism including a role for the auxiliary calcium channel subunit (Wang et al., 2016) and the presynaptic cytomatrix (Muller et al., 2012; Muller et al., 2014). The feedback system, as suggested by the authors, is a tantalizing prospect, though more insight into that mechanism would be necessary to elevate this paper to eLife. This is an excellent analysis of a new PHP player that would be better suited for a specialty journal. We have done our best to consider the implications of our data and have come up with a plausible model that this reviewer considers “tantalizing”. We hope that our model will spark similar interest in other laboratories, in other systems, thereby extending our existing work and ideas. Models are, by definition, unproven ideas. No one will ever put forward a model in a paper if the reviewers request that the model be proven. Models are intended to stimulate speculation and new ideas! With respect to elevating our work to the level of eLife, we refer the reviewer to a new paragraph that we have added to the Discussion section, referring to recent literature. The work that we cite de Juan-Sanz et al. 2017, recently appeared in Neuron. Because our data define a function for MCTP in the control of baseline release and plasticity under physiological conditions, I argue that our data are at least as relevant. Finally, as we now state in our Discussion, the effects of MCTP knockdown are as dramatic as that observed following the knockdown of other important presynaptic proteins such as Rab3 Interacting Molecule (RIM). As such, the phenotypes of mctp mutants are rather remarkable for their effects on baseline transmission, downstream of presynaptic calcium influx. We appreciate the concern of this reviewer. We have added new experiments and data to address these concerns. First, we went to great lengths to define, more precisely, the extent of MCTP co- localization with markers of the Drosophila ER. This was achieved using new HDEL- GFP transgenes, as suggested by reviewer 3. We also revised our protocols to image HDEL-GFP live, thereby preserving the integrity of the ER morphology. With light fixation and post-fixation processing we are able to precisely correlate MCTP-myc localization with the morphology of HDEL-GFP. Indeed, we think that our data are vastly improved (see new Figure 4). We thank the reviewers for prompting us to do this work. We now show that MCTP-GFP shows very strong co-localization with ER tubules within the presynaptic terminal (see New Figure 4). This complements strong localization in axons and cell bodies of an identified motoneuron. Second, we moved to heterologous insect cells (S2 cells) for cellular work and an additional structure function analysis of the MCTP protein. These experiments were guided by work on the extended synaptotagmins, done by the DeCamilli laboratory in heterologous cells (Idevall-Hagren et al.). We demonstrate that the transmembrane spanning regions of MCTP are necessary and sufficient for ER-localization of the MCTP protein. The transmembrane region is sufficient to localize GFP to the ER in S2 cells. Conversely, if the transmembrane domains are deleted, the truncated GFP-tagged MCTP protein is no longer retained in the ER. Thus, just like the ER retention signal HDEL, that is a consensus ER retention motif, the transmembrane domains of MCTP function as an ER localization signal. While there are always caveats to protein overexpression, we would like to point out that this approach remains a powerful tool in modern cell biology. Synaptic vesicle proteins localize to synaptic vesicles when overexpressed. The Rab proteins identify unique endosomal membranes when overexpressed. When overexpressed, we do not find MCTP appearing on synaptic vesicle membranes (Figure 4) or on the neuronal plasma membrane (Figure 3 and Figure 4), an observation that is now confirmed by work in S2 cells (Figure 3). There is close apposition of these markers in some cases. This is expected given the pervasive tubular architecture of the presynaptic ER. But, there is no evidence of pervasive ‘leak’ of the overexpressed protein onto other membrane systems. Finally, we now present evidence that the transmembrane domains of MCTP are necessary and sufficient for ER protein localization, just as HDEL and KDEL sequences retain GFP in the ER. As this reviewer points out, HDEL-GFP is an excellent ER marker and the same can be said for MCTP based upon our existing and new data. Finally, we demonstrate that overexpression of MCTP rescues a null mutation and does not create a neomorphic phenotype. So, there is no functional evidence for an overexpression artifact. The reviewer missed data that we presented in our original submission. We did measure presynaptic calcium transients, in response to both single AP stimulation and short trains of AP stimulation (Figure 6 was dedicated to these data). There is no change in presynaptic calcium influx. This was our stated evidence that MCTP must act downstream of presynaptic calcium influx during baseline neurotransmission and PHP. This was a major point of the original submission and remains so in the revised version. This reviewer seems to have missed the quantification of our data that we presented in Figure 5. In this figure, we specifically quantified short-term release dynamics across a full range of extracellular calcium concentrations. The confusion seems to arise because this reviewer is comparing example traces in Figure 5 and Figure 7, and these traces were recorded at different extracellular calcium concentrations (as indicated). The data in Figure 5 were recorded at 1.0 mM and the data in Figure 7 were recorded in 1.5mM Ca2+. These sample traces are representative of two very different experiments. Most importantly, the representative traces are precisely representative of the quantified data in Figure 5, calculating short-term release dynamics across a range of extracellular calcium concentrations. The specific calcium concentrations have been made more explicit so as to avoid confusion by other readers. In the original submission, we did perform measurements of calcium influx at high (physiological) extracellular calcium (Figure 6). There is no difference in calcium transients in response to single action potential or multiple action potential stimulation. Our calcium measurements show that there is no change in rate of calcium transient decay comparing wild type and MCTP mutants, supporting the conclusion that MCTP does not influence calcium buffering. The question of what calcium MCTP is detecting is a good point, but we can only speculate. What seems clear is that MCTP does not act to alter presynaptic calcium influx. In a conservative statement in the Results section we write, “We propose that MCTP normally functions to ensure that PHP is robustly and accurately expressed under variable [Ca2+]e conditions. 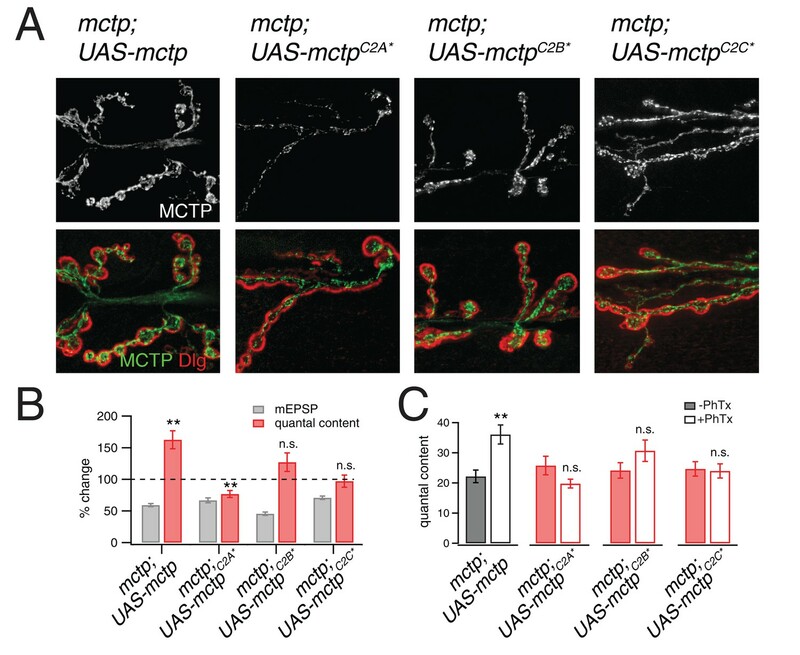 To do so, MCTP must have a profound ability to counter changes in extracellular calcium and ensure robust doubling of presynaptic release in the presence of PhTx.” Later, we speculate the following: “Since PHP requires calcium-coordinating residues in all three MCTP C2 domains, we propose that MCTP functions as a presynaptic calcium sensor and a source of calcium-feedback signaling to ensure robust expression of PHP.” We think that we have been careful with the language that we use. Our conclusions stick closely to the data and speculation is referred to as a ‘proposal’ or a ‘model’. We have played around with the order of the figures. We think that there are advantages and disadvantages to the flow of the text. We would prefer, at the end of the day, to leave the structure function analysis to the end. This is a good point. In fact, the data were actually presented in Figure 5A and B. We examined short-term release dynamics over a range of extracellular calcium concentrations as well as baseline release as a function of extracellular calcium. However, we never explicitly made the comparison that the reviewer suggests. We do so now in the text, drawing attention to specific comparisons in Figure 5A and B. We now state in the text: “We then compare short-term release dynamics for wild type and mctp under [Ca2+]e where baseline release is equivalent. For example, comparing wild type at 0.5mM [Ca2+]e with mctp at 0.7mM [Ca2+]e it is apparent that baseline EPSCs are equivalent (p>0.05) and so are short-term release dynamics (p>0.05). We thank the reviewer for this comment. BAPTA-AM blocks neurotransmission, consistent with results at other synapses. We are grateful to this reviewer for prompting us to explore this issue in greater detail. We worked hard to find conditions that would preserve the presynaptic ER and we think that we have been quite successful (see new Figure 4). We have imaged HDEL-GFP in a live preparation, followed by mild fixation/antibody labeling and then re-imaging of the same synapses for MCTP localization. The ER tubules in the presynaptic terminal are obvious in the live imaging data, and much better preserved in our new data. As a consequence, the co-localization of MCTP and HDEL is striking. This represents a major improvement to our study and, again, we thank the reviewer for prompting us to work hard on this result (it did take considerable time, with extensive repetitions of trial and error). With respect to the ER localization at or near active zones: Our new data from both live images and fixed synapses show that the ER is localized near the plasma membrane in tubules that extend throughout the NMJ. Given that active zones are distributed evenly throughout the nerve terminal (at ~400nm centers), it evident that the ER will come in close apposition to many active zones. The image that we show in new Figure 4 also highlights the fact that the ER is not, necessarily, present at active zones. The inset shows that half of a bouton lacks ER membranes, whereas active zones will be distributed throughout all synaptic boutons. We appreciate the concern of this reviewer and have worked hard to deal with this issue. We have added new experiments and data to our manuscript. First, we went to great lengths to define, more precisely, the extent of co-localization of MCTP with markers of the Drosophila ER. This was achieved using new HDEL transgenes, as suggested by this reviewer and improved protocols to preserve the presynaptic ER. Second, we resorted to S2 cells for cellular work and an additional structure function analysis of the MCTP proteins. We now show that MCTP-GFP shows very strong co-localization with ER tubules within the presynaptic terminal (see New Figure 4). This complements strong localization in axons and cell bodies of an identified motoneuron. We then pursued experiments to demonstrate that the two-transmembrane spanning region of MCTP is necessary and sufficient for ER-retention of the MCTP protein. The transmembrane region is sufficient to localize GFP to the ER in S2 cells. Conversely, if the transmembrane domains are deleted, a GFP-tagged MCTP protein is no longer retained in the ER and becomes cytoplasmic. To be clear, we define the word ‘trend’ as a difference in a sample mean that fails to reach statistical significance. For example, we previously stated, “There is a trend toward increased quantal content in animals expressing UAS-mctpC2B*, but this fails to reach significance.” We considered this to be common usage. However, we agree that there were places in the text that were less explicit. Therefore, we have removed all statements that include the word ‘trend’ from the text, allowing each individual reader to examine our data for themselves, as presented in our figures with the accompanying tests of statistical significance. We agree that this is preferable. Although your rebuttal cited examples that overexpressed proteins reflect the localization of endogenous proteins, this is not guaranteed for a novel protein. We recognize that the revised manuscript contains a lot of new data, and after discussions among reviewers, we agree that the manuscript is acceptable for publication if you clearly point out the limitations of using overexpressed protein to infer the localization of an endogenous protein. We have taken this request seriously and have endeavored to write a paragraph that highlights this issue and which cites relevant review articles and primary research studies that deal directly with the issue of defining where proteins reside within a cell. As can be seen from these papers, this is a non trivial issue and one that is worth highlighting. The following paragraph has been added to the text of our Results section. We thank Tingting Wang, Brian Orr, Ryan Jones, Nathan Harris for comments on a previous version of this manuscript and the Bloomington Drosophila Stock Center and the Iowa Developmental Studies Hybridoma Bank for genetic and antibody reagents. This work was supported by NIH grants NINDS RO1 NS39313 and R35 NS097212 to GWD as well as NIH grant (MH 092351) and a New Scholar Award from the Ellison Medical Foundation to DKD. © 2017, Genç et al.